Welcome to third part of 'JDBC in Java tutorial Series'. In previous discussions we came across, 'How to create a connection in JDBC 'and 'Create table in Java JDBC '. In this particular blog we will come across 'How to insert values to a table in JDBC'. We will create a connection to db and that obtain a statement to execute query on it. This is the overall project structure for today's discussion, we have added a 'my-sql-connector,jar' in lib folder to make the connection happen. Please make sure that the jar file is being added to the project's classpath. 'CreateConnection.java' class contains the code to create a connection with database and 'CreateTable.java' class contains the actual code to create a table in database using JDBC. 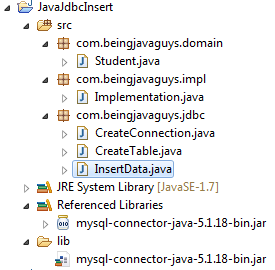 'InserData.java' is the main implementation class where jdbc insert query is executed exactly. In this particular blog we came across how to insert values in table in java JDBC. In upcoming blogs we will see more about JDBC and including JDBC Create Connection & JDBC Create Table & JDBC Delete and JDBC Update Implementation in Java.